Ori M’Ori of Shtar gave up rapping after he started attending yeshiva in Jerusalem. But it was a rabbi who encouraged him to continue. Ori M’Ori gave up rapping after he started attending yeshiva in Jerusalem. But it was a rabbi who encouraged him to continue. "He said it was a chillul Hashem, a desecration of G-d's name for me to stop rapping," said M’Ori. The young musician now raps Jewish inspired lyrics with Shtar, who have just released their debut CD. Ori M’Ori and band mate Binyamin Adam both left behind musical careers to move to Israel. They spoke to Israel National Radio about their unique brand of yeshiva hip-hop with a live band. Born in England, Benyamin Adam now lives in the Beit Shemesh area. He met M’Ori at the Aish HaTorah yeshiva in Jerusalem. "Originally it was just going to be the pair of us and we would take samples and breaks making an electronic album," says the musician, "but as time went one we realized the real power of making people interested is playing out live." The two assembled a band which today consist of Zakky Issac on percussion and back-up vocals, Alex Lopez-Dias on bass and David Epstein on drums. "The band is a striped down version of the album," says Binyamin Adam. "The CD is an electronic, eclectic mix of different beats, breaks and bass lines with acoustic sound." Ori M’Ori grew up in Seattle, Washington where he got involved in the local music scene which included hip-hop, drum-n-bass and jungle music. His interest in Judaism resulted in being given a free plane ticket to attend classes at Aish HaTorah, a yeshiva known for its outreach to Jewish youth who were raised in secular families. "I was really into what I was learning there," Murray states. "So I extended my ticket from two weeks to three months. After the three months I canceled my ticket." It was in the yeshiva setting that he was encourage to use his musical passion for a Jewish cause. It took him a while before he found fellow Aish student Benyamin Adam. "In early 2000 I was signed to London Records in the UK by the famous Pete Tong," says Benyamin Adam. "I was in an electronica, acoustic, trip-hop band called Lisp. To be honest, it was not too dissimilar to the music of Shtar. It takes organic instruments, mixes them with electronica and performs it live. We headlined a couple of film festivals, did some small tours and had radio play." But Benyamin Adam's budding interested in Judaism clashed with the band's schedule. "I guess Hashem (G-d) didn't want things to progress in that area. Certain gigs were falling on Rosh Hashannah, Yom Kippur and Pesach. There was some tension going on." A statement by Adam's father prompted him to seek out his roots. "My father always said there's three things that you die with. One is your name, two is that your going to be a Jew, and three is that just as you're born, you'll die. So I thought I would check out who I am and what I'm about." Benyamin Adam scheduled a two month trip to Israel, but like his band mate, ended up staying for good. "It was an exit plan to get out of the UK and try and come here to make a difference." Self-described as "shtark, stylish and g’shmack," the band raises eyebrows with it's hip-hop sound and yeshivish look. 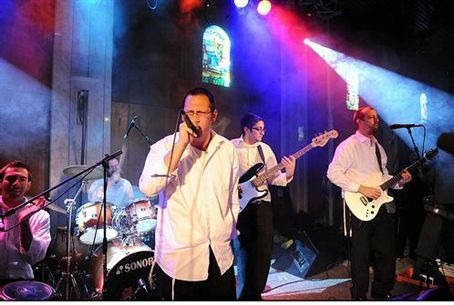 They have played for yeshiva crowds and religious oriented events, but have also done secular shows as well. M’Ori describes one such performance where the audience didn't know what to expect. "We played at the Barby in Tel Aviv. You have to walk down this alleyway with graffiti. We're all dressed in the standard yeshiva style [white button-down shirt, black pants and black kippah], and the five of us walked in with our instruments. It was like out of a movie. The woman taking tickets says, 'okay, that will be 40 shekels each,' and we tell her, no, we're the ones playing." Skeptical at first, the secular crowd ate it up as much as their religious fans do. "The real catch of our music is that if anybody would hear our music, they would think it could be played on MTV," says M’Ori. "But it's good for your soul, it's good for your head, it's positive, it's real." While some of the songs have Hebrew singing, many are not overtly Jewish oriented. "The whole essence of Shtar is to get people hooked in," M’Ori says. "Whether Jewish, non-Jewish, religious, not religious, we want to connect. We wanted to make it across the board." For a video of a past Shtar performance click here. Ben Bresky is a sound engineer living in Jerusalem and the host of the Israel Beat Jewish Music Podcast on Arutz 7 - Israel National Radio. For archive click here.